Feeding is always an exciting time in the sanctuary. The animals get really excited when they hear the food truck being loaded up! Today I am going focus on how, what, and when we feed our big cats, then later next week I will talk about how we feed our small cats. Then of course, we can’t forget about our fruit eaters the kinkajous and coatimundi! We will get to them as well I promise! But today, we are going to focus on feeding the big cats. Now, there are a couple different ways you can classify big cats. 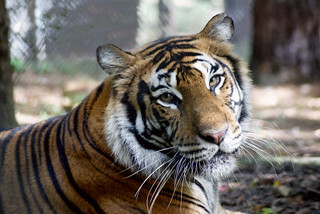 Here at Carolina Tiger Rescue we classify big cats by the sounds they make. Big cats roar and small cats purr! The big cats we have here are the tigers, lions, and leopard. Cougars are not big cats because they purr, but we feed them on a big cat schedule because of their size. 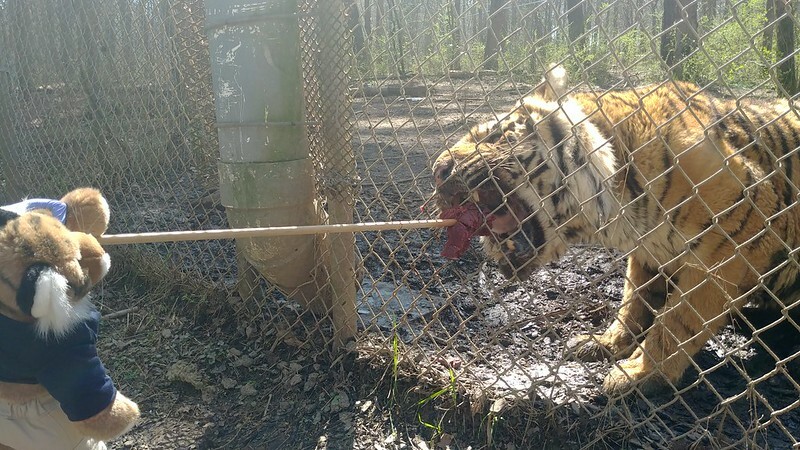 Big cats get fed 5 days a week here at Carolina Tiger Rescue, the days they do not eat are called fasting days. They do not eat on Tuesdays, and then depending on the schedule for the week, they will fast either Friday or Saturday. The reason for fasting is because big cats do not eat every day in the wild. They take down larger prey which they will gorge themselves on and this will keep them satisfied for a couple days. They also are not always able to catch prey! Tigers for example, on average, are only able to take down prey about 10% of the time, so when they do catch prey they will eat as much as they can immediately! Our cats though don’t have to worry about hunting, they are prescribed an appropriate amount of food by our vet and fed on a regular basis which helps keep them at a healthy weight! Now you may be asking how we feed our big cats, which would be an excellent question! 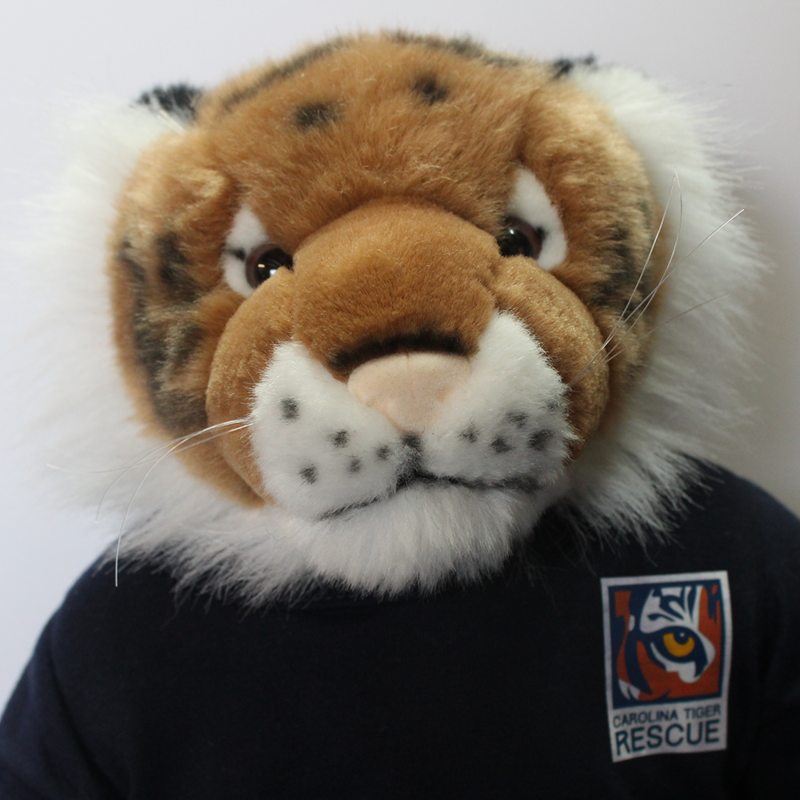 Safety, of course, is our number one priority here at Carolina Tiger Rescue. We want to be sure that not only the people are safe, but that the animals are safe as well. Sometimes, that means feeding our animals on a treat stick like I did for Fenimore in the picture above. Fenimore sometimes regurgitates his food and requires the food to be fed to him in smaller chunks at a slower rate to help prevent him from regurgitating. 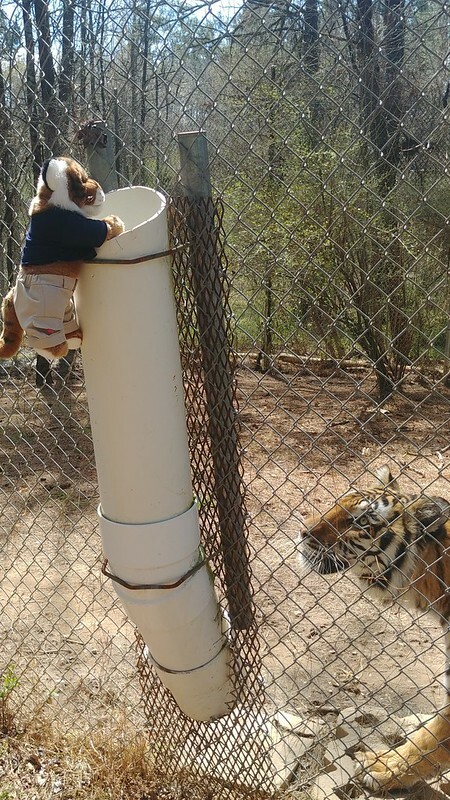 Most of the time though, we feed our big cats through their large food chutes like the one in this picture. This food chute is mounted on the outside of the enclosure and goes through the fence so the food can be dropped on the outside and falls on the inside of the enclosure. When we drop the food down we have to make sure the food does not get stuck, which is what I am doing in this picture. Madonna is watching very closely though isn’t she? We never put any of our arms down the food chute to ensure the animal cannot get us. As I said earlier, the amount of food an animal is given is based on their body condition and our vet decides what is best for them. We have some big cats, like Anthony Leopard who received 3/4 of a chicken at feeding time, which is about 4 pounds of meat. Our biggest guy, Caprichio Tiger, received between 12 and 18 pounds of meat 5 days a week, it just depends on the day. Caprichio eats about 90 pounds of food a week! That’s a whole lot of meat! Well, it’s time for me to get back to work. Later this week I will tell you about how we feed our small cats!